Did you know you could grill a whole chicken? No spatchcocking or beer can required! This is something I had been wanting to try for a while now. I did lots of research online about the best way to do it. I was dissappointed to find that every article I read online said that you can't get a whole chicken to cook evenly on the grill without spatchcocking it. If you are unfamiliar with that term, it means that you cut the spine out of the chicken and lay it out so it lays completely flat. I know that it works really well and produces great chicken, but I really wanted to try it whole. The only way anybody endorsed doing it whole was by sitting it on a beer can. You no doubt have seen that. I'm sure that works well too, but I don't like beer and wanted to lay this guy down on his back. I was feeling discouraged, and then I remembered my old grilling pal, Steven Raichlen. I have his grilling "bible" How to Grill and I love it. I turn to it whenever I have any grilling questions. I looked up chicken in the index in the back, and when I found the chapter on chicken, I was delighted to find that he begins with three different ways to grill a whole chicken. Yes! If Steven Raichlen recommends it, I know I can't go wrong! This is seriously the easiest thing ever. You just season your chicken, stuff some aromatics inside, set it on the grill, close the lid, and forget about it for two hours. No flipping or moving around or anything. So easy peasy! Set up grill for indirect heat. On a charcoal grill, place all the charcoal on one side, leaving the other side empty. On a gas grill, turn burner on one side to medium and leave the other side off. Pat chicken dry with paper towels. Put cut lemon or apple inside the cavity. Tie legs together using kitchen twine. Place some of the barbecue rub underneath the skin of the chicken on the breast and on the legs. Sprinkle the rest of the rub all over the chicken, front and back. It should be well coated. When the grill is hot, place the chicken, breast side up, on the cool side of the grill. Cover grill and cook for about 2 hours. Start checking it at 1 1/2 hours, especially if your bird is on the smaller side. Use a thermometer to make sure it reaches 160°. Remove from grill and let rest for a few minutes before carving. The trick is indirect heat. 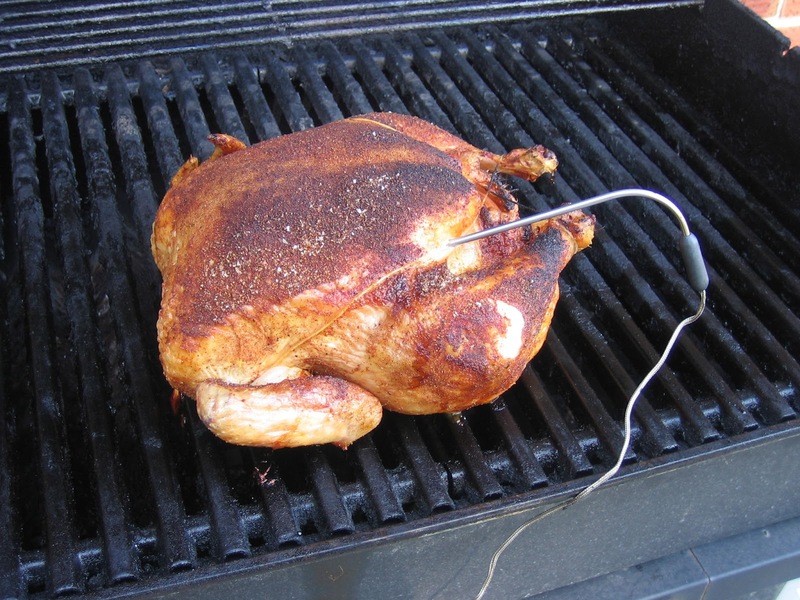 If you put the chicken directly over the hot flame, the skin will burn LONG before the meat is cooked through. By turning off the burner right below the chicken and closing the lid, you are basically recreating an oven, which is the ideal way to cook a whole chicken. On my grill, there are three burners and they run across left to right. So I turned the back burner on medium, the middle burner on low, and the front burner off. I set the chicken as close to the front as I could and still close the lid. I was surprised that it was done at 2 hours since I had a big 6 lb. bird. I didn't get a pic after we carved this guy; we couldn't wait to dig in! The dark meat (my fav) was juicy and fall-apart tender. The breast (hubby's fav) was moist and tender also. Perfection. 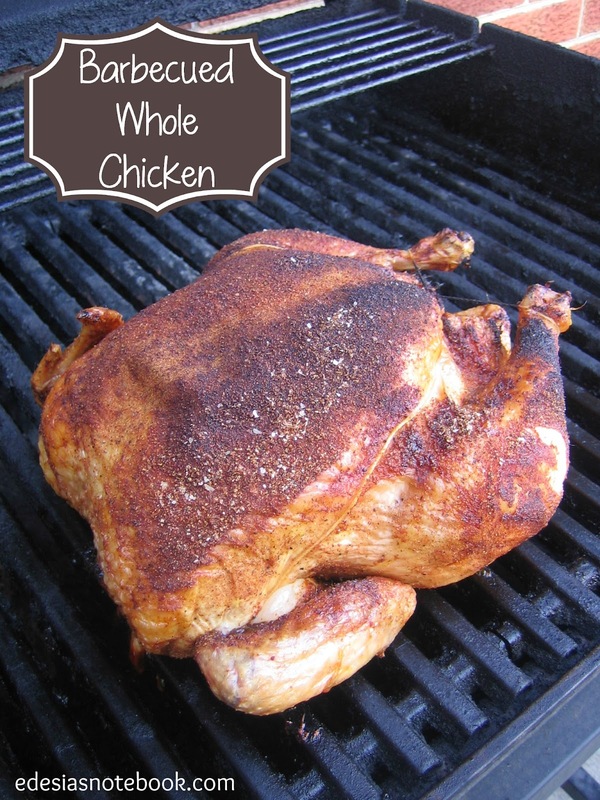 I used my favorite barbecue rub, but you can season this chicken any way you like. I served this chicken with grilled broccoli (I use a basket for that) and cheesy broccoli rice. It was a truly awesome meal.